When replying to posts about repairing defects or other voids in wood, I often suggest using epoxy putty. The problem with that is that unless someone has used epoxy putty before, it can seem intimidating. It’s really simple to use, and once you play around with it a little, you’ll find yourself using it more and more. It’s also extremely durable and can stand up to wear and moisture. 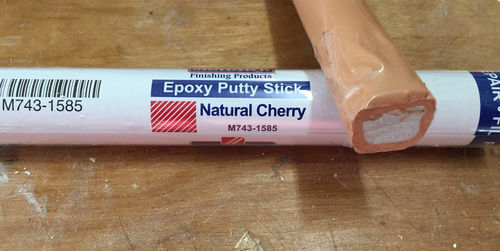 Epoxy putty comes in a stick and is made up of two parts, as shown below. Think of it like a cannoli, only not as tasty. In order to use it, simply slice off a small piece, remove the plastic wrapping and knead it until the color is uniform. It helps to keep a small dish of water nearby to dip your fingers into. 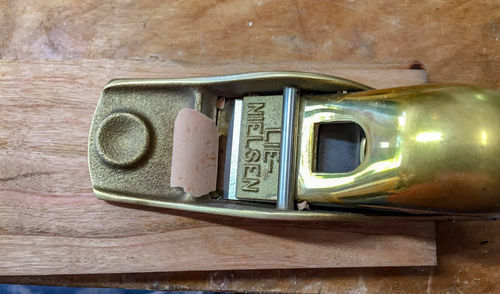 This keeps the epoxy from sticking to your hands. 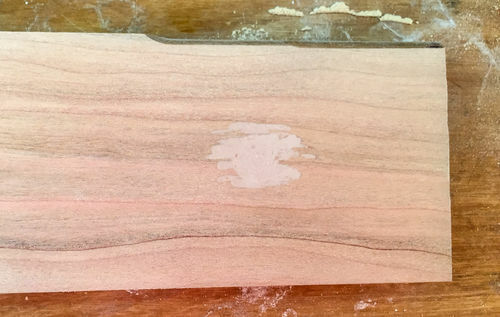 In this post, I am going to go from start to finish repairing a circular defect in a piece of cherry. I created the defect using a 1/2” brad point bit. 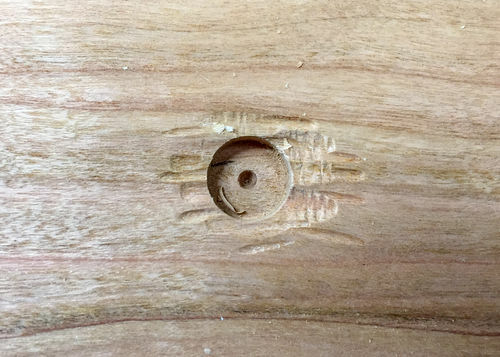 It could be a knot, a deep gouge, a wormhole that you wish to hide, or an errant hole drilled in the wrong spot. Whatever it is, the considerations are the same. The goal is to fill the void in such a way that it doesn’t stand out on the board. You don’t want it to catch the eye of a casual observer. If you can tell someone that there is a repair on a board and they can’t find it, even better. Ideally, if you point it out — as I’m effectively doing for you in these photographs — it should surprise them that it’s there. The first consideration is the shape of the void. A perfectly round hole like this one is virtually impossible to patch and grain over without it standing out. By making it irregular as I’ve done in the photos, it’s much less likely that the eye will detect it without close examination. In other cases you’ll need to make a similar judgment call. For example, a deep tear out might be irregular enough to begin with that all you need to do is sand it smooth to prepare it. The next thing is color. Mohawk makes the putty available in 12 colors. I found it useful to make a small sample disk of each color so that I can compare the fully cured epoxy color to the wood. I also have needed on occasion to make a custom color by blending different epoxy sticks and sometimes a little extra pigment. 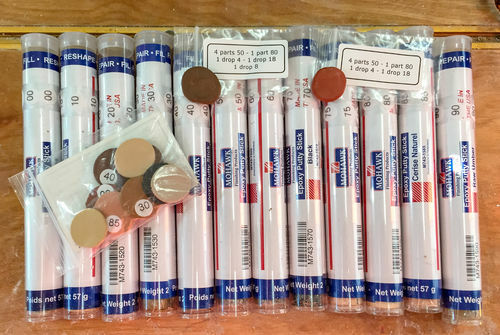 I use Mixol pigments, and the numbers shown on the recipe for the sample piece represents the ratio of different putty colors and what Mixol colors are used. 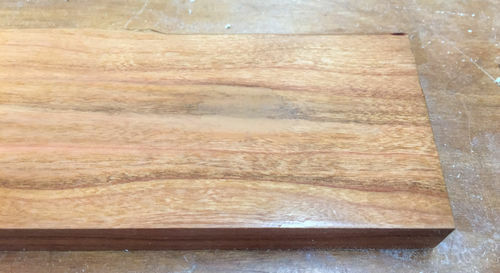 For this example, I am simply going to use the single Natural Cherry color of the putty. 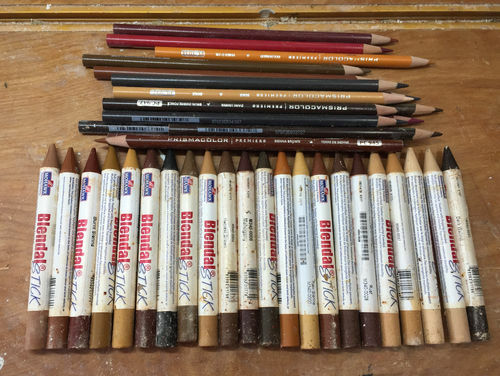 I’ll address color differences and do the graining with Berol Prismacolor pencils and Mohawk Blendal sticks. As I mentioned earlier, a perfectly circular hole like this will be virtually impossible to fill and grain such that it’s not obvious. To deal with that, I took two small gouges and made the area around the hole irregular. The gouges are about 1/4 and 1/8”. Sometimes a V-groove is helpful as well. To fill the area, first slice off a small piece of epoxy putty and knead it smooth. Use water to keep it from sticking to your fingers. Press the putty firmly into the hole and surrounding area. Set a timer for 20 to 30 minutes. The reason is that at that point in the curing process the epoxy is firm, yet is still workable with cutting tools. Here I am using a block plane to thin down the layer in order to make sanding easier later. Here is the rough cut after planing. Allow the putty to cure another hour or two. Here is the patch after sanding. Notice it’s a pretty good color match. Generally a little lighter than the surrounding wood is best. Also notice that the work to make the hole irregular has already begun to obscure the patch. Now, the fun begins. Using the Prismacolor pencils and Blendal sticks, I begin to blend the patch in with the surrounding wood. It’s often not necessary to completely color the patch in — the goal is mainly to obscure the edges, since that’s what will tend to catch the eye. This phase of the process takes some practice. The key advice I can give is to go lightly and gradually build the colors. If you mess up, you can wipe it clean with naphtha and start over, so don’t worry about mistakes. And here is the final result after a top coat of lacquer. It actually looks much better in person. The camera has enhanced some details that aren’t as visible to the naked eye. Even so, I think it looks pretty good. Note too that you can do a similar patch with Timbermate wood putty. It’s not as durable as the epoxy putty, but for smaller defects, it’s often easier to work with. Obscure any regular defect shapes and do the graining in the same fashion. Cool… thanks for the tutorial Rich. Lacquer doesn’t make the prismacolors run? I’ve cut wooden plugs to fix defects before but even if its the same type of wood its very visible because of the differences in the grain. I’m adding this to my favorites, I’m sure it will come in handy. Thank you for the feedback. No, the lacquer doesn’t cause any running, but particularly in the case of the Blendal sticks, it sets the color. With some practice you’ll get an idea of how it affects the color in the finished product. Excellent product Rich but eyewateringly expensive here in the UK at almost $20 per stick! 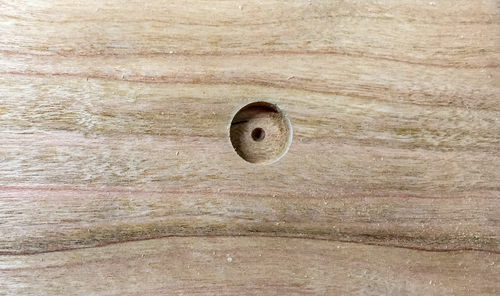 I’ve also used sawdust and glue to fill shallow holes. 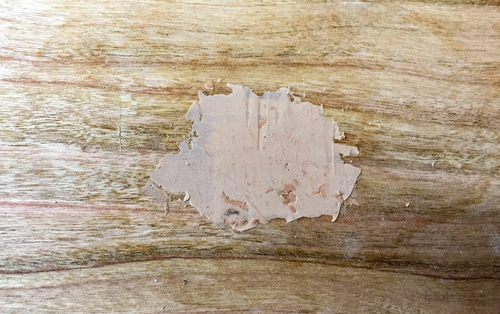 There are also 2 part fillers like JB Weld Wood putty that has slightly different components that you mix together using a putty knife and apply. The nice thing about expoy is that it doesn’t shrink as it dries. That is pretty steep. Fortunately you don’t need a full array of colors if you have other means of coloring the repair. I ve also used sawdust and glue to fill shallow holes. There are also 2 part fillers like JB Weld Wood putty that has slightly different components that you mix together using a putty knife and apply. The nice thing about expoy is that it doesn t shrink as it dries. Yes, JB Weld makes a two part epoxy putty. So do several other companies. I use Mohawk products, but in the end they all do the same thing and the above techniques can be used on them to create an identical repair. This post was specifically about a method I often suggest here on LJ. I felt it would be useful in the future when questions come up about repairs and I think epoxy putty would be a good solution. I made it a blog series to keep the option open to document other repair methods I use as well. The intent is not to document every way possible to fill wood. However, I strongly encourage you, and other LJs, who have their favorite materials and techniques to do a blog post to document their technique. Be sure to include as much detail as possible and photos of before and after so others can assess various options and choose what’s best for them. Great tutorial, Rich. You be a good teacher. Very nice Rich. Probably the most “cosmetically impressive” (if that’s a thing) repair I’ve seen. Very helpful and informative information. Thanks for the post Rich! Thanks guys. I really appreciate your compliments. Rich, really well put together and very much appreciated! Amazing, thank you Rich for the tutorial.